Labeling quilts is one of my least favorite parts of quilting, so most of my quilts are unlabeled. I did a marathon labeling session this weekend and finished up 5 quilts, some of which I'd called finished before, and am happy to be sending these on to deserving recipients this week. 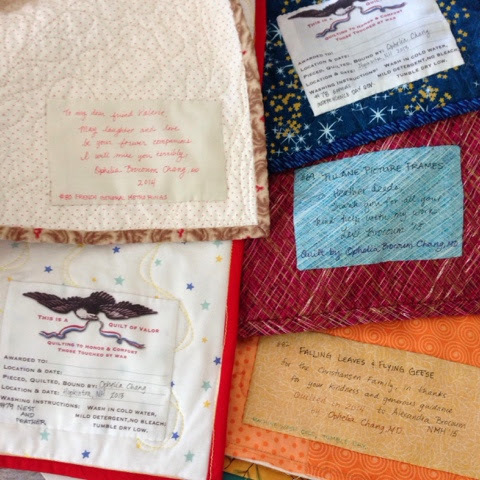 There are two Quilts of Valor, which still need pillowcases, and three gift quilts for others. This is my Barcelona Jewel Quilt. I spent almost the whole day on this, but am happy with my progress. 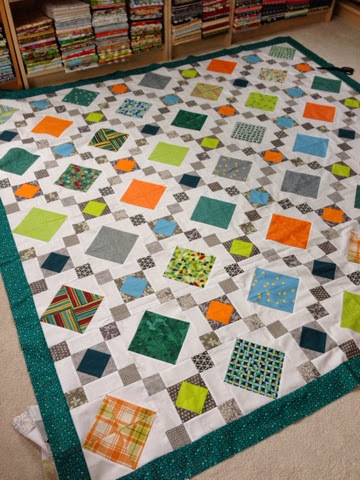 First, I put this teal border on, and it makes a huge difference in the way the quilt catches my eye. Before this border, I thought it was done, but it was lackluster and I didn't feel strong affinity for it. Now, I think I love it! I also put it on the longarm frame, chose a poly batting, and pieced up a backing for it. I received my copy of Quilting Wide Open Spaces by Judi Madsen, and a preliminary reading has inspired me to do custom quilting on it rather than an all-over design. She advises stitching in the ditch to make the quilting "pop," and my initial work on this quilt actually seems to be having this effect on the actual piecing. I'm excited to be doing something new.